Welcome spring, oh how I've been waiting for you to arrive. I'm craving spring greens like watercress but somehow the salad route is not the way I want to go. 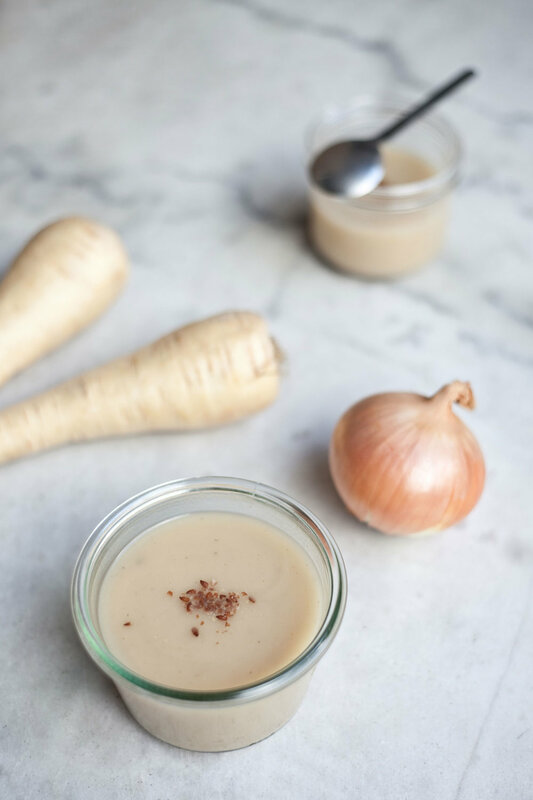 It's still pretty gray and cold these days in Paris so I think a warm detox soup is in order. 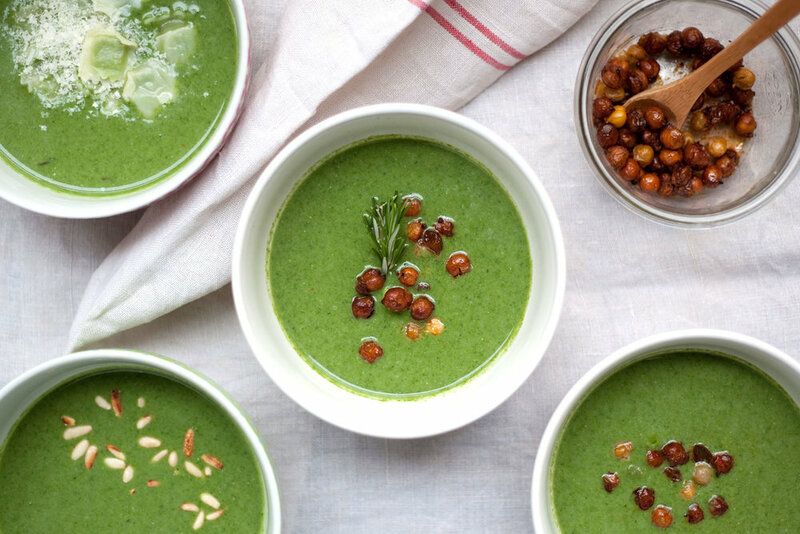 Watercress is apparently a powerhouse veggie, high in many nutirents especially vitamin K and vitamin A—good for the bones and the eyes, and a versatile vegetable that can be steamed, eaten raw as a salad, and liquidized into soup. In a large saucepan, heat up your butter and then toss in the onion, shallot, and garlic. Sauté for about a minute or two. Add the potatoes and sauté them all together until translucent. Add 1.5 liters of vegetable broth to the ingredients, cover, and bring it to a boil. Then lower the heat and simmer until the potatoes are soft. Rinse the watercress clean. Tear off about a half inch of the ends and rough chop the rest. Add the watercress. Cook for a few minutes or until the watercress has wilted. Allow the soup to cool. Using a hand blender, mix until smooth. Rewarm over low heat before serving. Serve with a drizzle of olive oil or a dallop of crème fraîche with some toasted pine nuts. I never ate so much butter until I arrived in France. It's just superior to the American one. Simple as that. No competition. I use butter to sauté my alliums and potatoes in this recipe but you can choose your oil of preference. Brrr, winter season is right around the corner and this soup fills me up and keeps me nice and toasty. One of the best things I love about Paris is that it is full of ethnic diversities. You can find pockets of many ethnic communities spread thoughout this city. I love the idea of being able to dash over to the 15th arrondisement just to pick up a date syrup at a Persian grocery store. This is where you will find a restaurant row of Persian cuisine and grocery stores a.k.a Petite Perse or Little Téhéran. As I enter the grocery store, my sensory receptors are instantly heightened, things seem foreign and I am intrigued. This is where I can easily pass an hour picking up every jar and package to decipher its labels, discover ingredients and wonder how these things are used. What gives me pleasure is the feeling of having purchased my date syrup straight from Persia—minus the cost of airfare and flight time! I appreciate every drop of syrup that comes out of the jar because I know it has traveled a long way. Plus, it's a nice conversation piece. "Oh, the date syrup? I bought that from ̶P̶e̶r̶s̶i̶a̶, umm—I mean the Persian grocers in the 15th..."
I can carry on about other goodies that I buy from Litte Africa (Chateau Rouge in the 18e), Chinatown (Ave de Choisy in the 13e, Arts et Métiers in the 3e, Belleville in the 10e, and Little Tokyo (rue St. Anne in the 1er and 2e) but it'll be a long list. Today I was in La Chapelle (Little India in the 10e) for a baby bump portrait session. I was early so I picked up some mangoes and red split lentils for this recipe and made a pit stop at the no-frills Indian take-out joint for its chai. With my hands cupped around the chai, I stepped out in the cold and hovered over it. I took in the scent of spices wafting up from my masala chai, lifting my head towards the streets in front of me and with a long exhalation felt removed from wherever it is that I come from. It didn't matter. Today, I was in India. Heat the olive oil over medium heat in a medium Dutch oven or heavy pot. Then add the diced carrots, celery, onion, minced garlic and bay leaf. Add some salt and mix. Cover the pot and let it cook for 5 minutes. Uncover and add the cumin seeds, stirring it around. Then add the tomato paste, the liter of vegetable broth and lentils. Bring it to a boil. Turn down the heat to a low simmer. Add the curry powder and curcuma. Cover and let it simmer for about 15 minutes or until the lentils are soft. 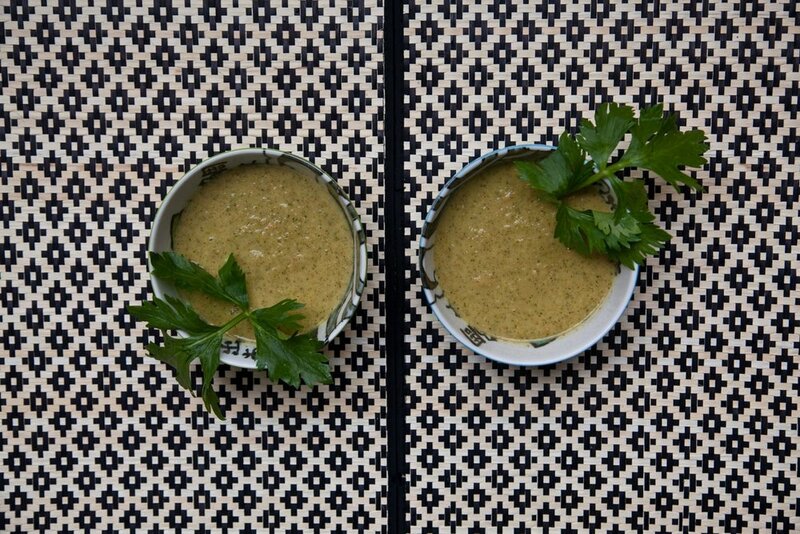 I usually take a cup of the soup and pour it in the blender with a small handful of fresh coriander. Then I stir this back in with the rest of the pot. It gives it a chunkier consistency. Squeeze a bit of lime and garnish with fresh coriander. It's kind of a cross between lentil soup and lentil curry. You can add more liquid to it for a soupier mix or less liquid for a thicker consistency. If you opt for the thicker consistency, you can top it over some basmati rice for a more filling and curry like meal.